The latest Doctor Who themed toy from Character Options is one of the best value items the company has released so far - it's also one of the most entertaining. 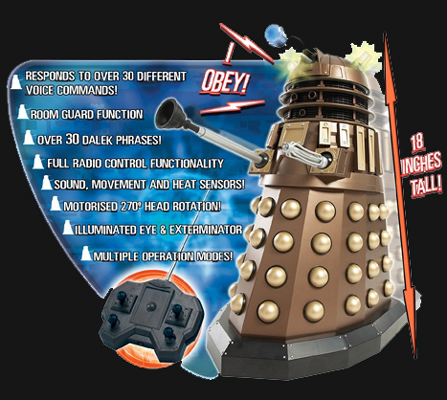 The 18" Voice Interactive Dalek has so many fantastic features that it's difficult to know where to start. And, like an excited child on Christmas morning, this reviewer couldn't wait to get his hands on the goods. The first task was getting it out of the ridiculously over protective packaging. It's good to see that, with an electronic toy of this standard, Character Options want to ensure that it reaches the owner in the same condition that it left the factory shop floor. However, this does mean that owners will have to spend a good 20 minutes carefully unwrapping everything. If you don't want to retain the packaging, you can probably get the Dalek up and running in a few minutes by simply ripping the box open and snipping the plastic ties, that keep everything in place, with a pair of scissors. Once it's out of the box you can finally appreciate how incredibly detailed it is. The attention to detail is nothing short of crazy (but then Character Option have a habit of going that extra mile). Even before you switch it on (and hear the sounds and see how many different lighting effects it has) it looks like a work of art. Next you can either get out the remote control unit and use this as a remote control vehicle, or you can experience the Dalek's built-in voice activated operating modes. On the remote control front, everything is pretty simple to get to grips with. There's the usual movement controls (forwards, backwards, left and right) as well as one controls that allow you to rotate the head and another to move the iris stalk. And finally, if you press the button in the centre of the control panel, your Dalek will utter one of around 30 different phrases. With the voice activated operating modes there are a number of interesting options. When you turn the Dalek on it runs a quick diagnostic and then states: "Dalek unit status: 100% efficiency. Awaiting input". It won't move anywhere until you deactivate its mobility restraint switch - which you do by holding down one of the hemispherical protrusions (or "Dalek bumps" if you want to be less technical) for a few seconds. To enter voice activation mode (or to give the Dalek any voice commands at all) you need to get the Dalek's attention. This you do by simply saying: "Dalek". Once it's recognised the command it will say: "Yes". Now you can enter into a series of voice activated modes. To start with let's look at the extensive memory databank that the Dalek carries. To do this you must activate the Dalek by saying: "Dalek." Wait for it to say: "Yes" and then you have to say: "Do you recognise..." (wait for iris stalk to flash) and then say the name of a Doctor Who character or creature. If the Dalek recognises what you say it will tell you something about it. For example, if you say: "The Doctor" it starts ranting about him, or if you say: "The Emperor" it starts to shake as it tells you how powerful he is. You can also use the Dalek to guard a location - say for example you want to know if someone approaches your bedroom door. Simply place the Dalek outside your door and activate it. Once it's ready to accept your voice command, you simply say: "Guard location". Then, when anyone comes near, it will warn them to leave the area otherwise they will be exterminated. They have a couple of seconds to comply before it cries: "Exterminate!" and makes a firing sound. And, should you want to sneak past it you simply have to say: "Voice command override." Or you can ask the Dalek to follow you around; turn around (it turns 180 degrees from the way it is facing); enter patrol mode (in which it moves around a set area avoiding obstacles and if it encounters anyone, who fails to respond with the correct password when challenged, it exterminates them); programme it with specific movement, battle and tactical commands; or set it to defence mode - where it will roam the surrounding area to locate moving objects. And, if that wasn't enough, there's even a game mode which can be played with a group of friends. The Dalek will identify one person from your group as The Doctor. Then it will attempt to pick that person out from all the rest and exterminate them. It even comes equipped with mood/anger mode. If you tap its head a little too much, or if its sensors detects something it doesn't like, it will move around exterminating everything close by until you get it to obey you again. Surprisingly it even works on fairly thick carpet - although obviously it works best on thin carpet, or ideally a smooth surface like a tiled or linoleum floor. 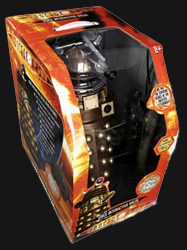 This is about as close to owning a real Dalek as is possible and for only £100 Doctor Who fans are being spoilt.